Illuminometers are used for measuring brightness in lux, fc or cd/m². 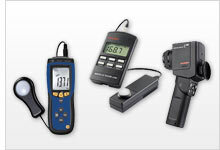 Some illuminometers are equipped with an internal memory or data logger to record and save measurements. The measurement of light intensity with an illuminometer is becoming increasingly important in the workplace due to safety concerns. PCE Instruments' illuminometers with data loggers are highly regarded in the industry due to the devices' cosine correction of the angle of incident light. Many illuminometers include software for detailed analysis and offer different interfaces for transferring measured data to a computer. Illuminometer PCE-170 A to 40,000 lux, internal sensor, automatic zero adjustment. The illuminometer has a large measurement range, short response time and a compact housing allowing for quick, effortless one-hand operation. The PCE-172 Illuminometer is used for accurate measuring of brightness in the industrial sector, commercial sector, agricultural sector, and for research. The Illuminometer can also be used to test computer screen brightness in the workplace and in the world of design. The PCE-174 Illuminometer with memory for up to 16,000 readings is used for measuring light in industry, agriculture, and research. The Illuminometer is also used for determining illumination in the workplace, shop window displays, and by designers. PCE-EM 888 is a portable handheld illuminometer ideal for monitoring environmental conditions and the performance of heating, ventilation and air conditioning (HVAC) systems. This multifunctional digital device is used to measure wind speed, volumetric air flow, temperature, relative humidity, light and barometric pressure. The Illuminometer LXT consists of a measurement sensor and a small wall bracket or holder with a 1.5 m / 4.9 ft cable, and a light transmitter. The application field of the Illuminometer LXT is the continuous measurement of daylight and light control in photo labs and production facilities, such as in the manufacturing of food and medicine. The LXT Illuminometer consists of a flow sensor with handle and a wall bracket to 1.5 m cable, a light transmitter, and a digital display. The main use of the Illuminometer is in the continuous light measurement and light monitoring of photo labs and production areas, such as food or drug manufacturing. The PCE-172 illuminometer is used for accurate measuring of brightness in the industrial sector, commercial sector, agricultural sector, and for research. The illuminometer consists of a measuring sensor with handle, a wall bracket with a 1.5 m / 4.9 ft cable, and a light transmitter. The main field of application of the light meter is the continuous light measurement and light monitoring of photo laboratories and production areas, such as food or drug production. The illuminometer consists of a measuring sensor with handle, a wall bracket with a 1.5 m / 4.9 ft cable, a light transmitter and a digital display. The main field of application of the illuminometer is the continuous light measurement and light monitoring of photo laboratories and production areas, such as food or drug production.